Who Is Selling Houses In Tallahassee? I am always keeping a watch on who is selling houses in Tallahassee, and I can tell you with measured confidence the source for home sales in Tallahassee. 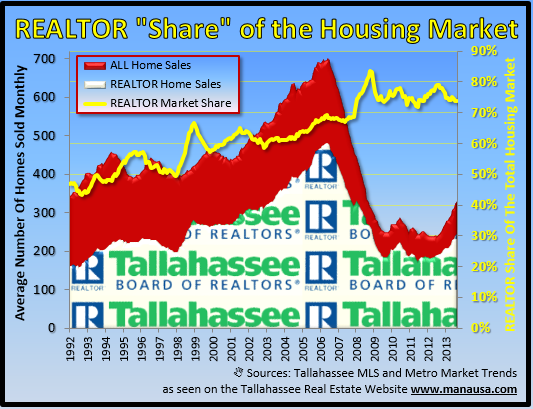 Right now, it is REALTORS that are selling houses in the Tallahassee real estate market, as our graph clearly shows. With a glut of homes for sale in Tallahassee, it might be you who needs to know by whom these homes are being sold. Our real estate graph shows important information for determining the source of home sales in Tallahassee. The red area measures all recorded home sales in Leon County, while the white area shows all Leon County home sales posted to the Tallahassee MLS. The resulting yellow line (measured on the right vertical axis) measures the REALTOR "share" of the Tallahassee housing market. In a nutshell, we are seeing 73% of all homes sold also appearing in the Tallahassee Board of REALTORS Multiple Listing Service. Does this mean that REALTORS are selling 73% of the homes sold in Tallahassee? And does this mean that 27% of homes are sold "For Sale By Owner"? To understand the math behind this analysis, we have to explain the source of the information that we utilized to create our graph. The red area measures "all" home sales in Tallahassee. These are found by examining all of the home sales recorded with the Leon County Property Appraiser, and we utilize a third-party company (Metro Market Trends) who compiles this information several times per month. This database is compiled for the purpose of understanding the trends in the real estate market in Tallahassee. The white area measures the home sales recorded in the Tallahassee MLS. This is not a database created to determine trends, it is a marketing distribution system which is designed to allow REALTORS to market their homes for sale. Because of this, the data is raw and it is imperfect (from an analytical standpoint). The MLS was not designed to "prove" that REALTORS are selling houses, it was designed to promote the houses that REALTORS need to sell. Thus, there are some REALTOR sales that do not appear in the MLS because they were sold by REALTORS before they could be entered into the system. There were also homes that were under construction (or even those not yet started) that were sold by REALTORS. Some of these homes are entered into the MLS after the fact (and thus appear in the REALTOR share above), while many do not. Therefore, the graph above lets us know that REALTORS are selling houses at a rate higher than the 73% we see in the graph. How high the number actually is cannot be determined with these numbers, but my experience leads me to believe it is over 80% but under 90%. The remaining 10-20% of all home sales are those done by builders, For Sale By Owners, Banks, and non-arms length sales executed between related parties. If you want to know who is selling houses in your neighborhood, simply drop me a note and we can schedule a time to show you an in-depth report.